Issues of peace and conflict sometimes seem to present a distinctly American face – but these issues certainly have roots that well predates our great American democratic experiment. We go to a place that may seem a bit odd to some modern secular westerners. With religion – where the juxtaposition of peace and conflict is not only front and center but, seemingly, God-inspired. Let’s look at this from the perspectives of the three great western monotheistic traditions – of Judaism, Christianity and Judaism. Starting with the Hebrew Bible, at the very first book of Genesis, it doesn’t take long for conflict to rear its ugly head and in a somewhat surprising story. Whether we are of religious persuasion or not, we all know the story. God gets through the business of creation in six days, creating humankind – male and female – in the sixth day. Then God rests. The serpent comes along who tricks the woman Eve who likewise gives of forbidden fruit to the man Adam. God comes to visit, finds that the couple have sinned and, in retribution, condemns serpent, woman and man. To the woman he says: “I will greatly increase your pangs in childbearing; in pain you shall bring forth children, yet your desire shall be for your husband, and he shall rule over you.” No kidding; the debate rages on thru to today. Conflict bears its fruits in the first generation after this couple as the oldest son Cain murders Abel. And so unleashes a world of conflict – ceaseless toil, famine, war. And in-between Yahweh of the Hebrew Scriptures and Muhammed, we find the founder of the Christian faith – one Jesus of Nazareth. Why did he come? To bring peace and good will toward men? That’s the Christmas story but not necessarily the whole story. Do you think I have come to bring peace to the earth? No, I tell you, but rather division! and daughter-in-law against her mother-in-law. 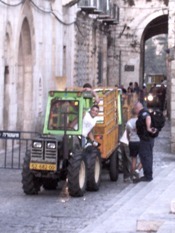 Trash pickup inside Jerusalem’s Lions Gate – just north of the Temple Mount. First, just a little security check. So to you baby-boomers who like me who rebelled against our stodgy parents in the 60s and 70s, be forewarned. It’s your turn as GenX and GenY step up. Only this time the fight is not so much over civil rights or women’s lib or a war in Viet Nam, it’s over who pays the bills – in a world that seemingly has lived beyond its means. The Christian Experience. To this point, the discussion has been organized around the three monotheistic religions of the west. That’s because those are the roots from which our American culture sprang. And for a few more moments, let’s dive a bit more deeply into the into the unique heritage of our country as a Christian nation. Whether you like it or not, this is a heritage that has shaped this US of A from the get-go. Whether for better or worse, I’ll leave that for you to decide. Massachusetts was settled by Pilgrims and Puritans, Rhode Island by break-away Baptists, Pennsylvania by Quakers, Maryland by Catholics. And Georgia by criminals – but that’s really not a religion, is it? But it certainly adds to the color of heterodoxy. To get a better understanding of how this shakes out, we need to go back a bit further in time – to the founders of the faith in the first century AD. Read on, you may find this discussion both interesting and troubling. But here’s an advance warning! There’s probably something for everybody not to like. If you’re an evangelical or fundamentalist Christian, these thoughts – though preliminary – may push a few buttons. If you’re a non-Christian who is wondering how this is at all relevant, watch out. You can’t escape this legacy, either. So, let’s divide this discussion between the theology and the practice of conflict as experienced in the Christian movement – right from the get-go. And focus on just a few of the key players. At the end, we’ll talk about how this is relevant to the new normal in the U.S. today. Three of these gospels appear to draw from similar source material; yet when examined closely, each has it own spin. The fourth book is completely different. Examined closely, each leads in a somewhat different direction. We start with the Gospel of Matthew – reputedly written by a tax collector for Roman occupiers of Palestine, a man who became a follower of Jesus. More so than the other gospel writers, Matthew emphasizes Jesus as a fulfillment of Jewish prophecy – as the manifest destiny of God’s plan for Israel. He goes so far as to re-interpret Hebrew scriptures, for example, taking a birth spoken of by the Hebrew prophet Isaiah and re-interpreting it as a prophecy of a virgin birth by Jesus’ mother Mary. Next comes the Gospel of Mark. Mark was reputedly the young son of a wealthy family in Jerusalem. His gospel is distinctive in that it goes light on the teachings of Jesus, emphasizing action instead. And he portrays Jesus’ disciples as a group of dimwits, like the gang that couldn’t shoot straight. His is the account of the resident skeptic or cynic. About the only people in Mark’s gospel who grasp his divinity and label Jesus as a Son of God are a demon possessed man and a Roman centurion at the site of Jesus’ death by hanging on a tree. Luke’s gospel is the only one purportedly written by a person who never met the Christian founder. Tradition places him as a doctor who would accompany the apostle Paul on journeys to evangelize non-Jewish places in what is now Turkey and Greece. Luke is unique in his emphasis on social justice. In Jesus’ famous Sermon on the Mount, Matthew’s gospel quotes Jesus as saying: “Blessed are the poor in spirit.” Luke gives this a totally different twist, with Jesus simply saying “Blessed are the poor.” For Matthew, the blessing is based on spiritual condition; for Luke it’s about economic and social condition. Luke is also the only gospel to tell the parable of the Good Samaritan, a story where the social outcast and not the prominent leader helps a man who has been robbed and beaten. Finally, there is the Gospel of John, ostensibly written by the disciple who was closest to Jesus in his ministry. John’s account is very different than that of the other three. In his version, Jesus doesn’t tell a single parable. The message of Jesus via John is more mystical and spiritual – focused on individual salvation and regeneration – being born from above. Of all the gospels, John’s Jesus gets up close and personal. With an intimacy that can be wonderful, awesome, mysterious, transcendent, painful. Almost like touching God. So, what relevance does this have to America’s experience and to the new normal in 2011? Simply this. All of the same differences and nuances we saw played out in the early Christian movement are still at work today. Think Matthew and prophecy fulfilled, like the sense of “manifest destiny” that propelled the United States to expand from the Atlantic to the Pacific, to today’s concept of “America first” and to the notion of exporting the grand experiment of democracy worldwide. It’s the theology of Ronald Reagan’s America as a “city on a hill,” a beacon of democracy, market capitalism and hope for the rest of humankind. What about Mark the skeptic? His is the gospel for America’s cynics – those who see the country going down the tube with every Wall Street businessman and banker a crook, every governmental action a form of conspiracy. Every man for himself (or herself). The gospel of the libertarian (or the survivalist). Then there’s Luke. We can spot him as the house Democrat a mile away. An advocate for social justice. Or in today’s world, the one-time civil rights crusader morphed into environmentalist. Finally, John. Are there those who view America in spiritual, almost mystical terms? Well, yes. Perhaps not too surprisingly, the spiritualists fall into two camps. On the left, there are the true socialists (in an earlier time known as communists). They are a step beyond Luke – who view saving the planet not simply as the right thing to do, but as a spiritual imperative. Who value salmon over humans. Or reducing carbon footprint over feeding the hungry. On the right are those who revere “the invisible hand” of Adam Smith. The preservation of the free market no matter who suffers. Libertarians, gold fanatics and monetarists who view gold specie as having a power of its own. Tea party activists bent on destroying government at all costs. How do we bring these divergent views together? In an economic and financial crisis such as what still faces the U.S., is there any reasonable hope of a new consensus? Before we can answer that question, we have to step beyond question of mere theology into that of practice. The Practice of Conflict. To gain an understanding of how conflict has played out on the ground over the last two millennia, it is important to look at the experience of the Christian movement from the perspective of the early leaders after their leader departs the scene. For simplicity, the initial focus is on the three leaders of the 1st century Christian movement. Even if you’re not religious, you’ve probably heard their names – Peter the stalwart apostle of Christ, James the brother of Jesus, and Paul the latecomer convert. Each plays a role that has proved pivotal down to our own time. Let’s start with Peter. This is the guy who declared Jesus as the long-awaited Messiah of history, the rock on whom Jesus then said he would build his church. Then just as quickly, Peter is referred to as Satan by his master. This is a disciple with a heart of gold, but who tends to act before he thinks. When his master is arrested, he slices off the ear of one of the gendarmes, then a few hours later denies three times that he is in any way connected with the now threatened group. After the death and reported resurrection of his Lord, Peter becomes the first spokesman and leader of the Christian church. But not for long. Somehow, he is edged aside by the next two arrivals on the scene. So, then there’s James. He was certainly no supporter of his brother when Jesus was out teaching, but rather wanted to restrain him as a man who had “gone out of his mind.” Despite this antagonism, somehow James edges his way into leadership of the Jerusalem church after his brother has left the earthly scene. How? The New Testament provides few clues. However, a Jewish and later a Christian historian both describe how pivotal James became not only to the Christian movement but the broader culture of 1st century Palestine. He was called a “bulwark of the people.” The Jewish historian known as Josephus makes it clear that the murder of James sets in motion the events that would lead to the insurrection of the Jewish population and ultimately the destruction of Jerusalem at the hands of Rome in 70 AD. Finally, there’s Paul. This fellow is the ardent anti-Christian who has a dramatic conversion experience and switches sides. He accounts for the bulk of the writings that today constitute the Christian New Testament. And he is the one that is remembered most as propelling this new hybrid religion into western civilization of the Roman Empire. The man who writes the first history of this Christian movement – called the Acts of the Apostles – glosses over this transition in leadership and authority from Peter to James to Paul. He gives few clues as to the power struggle behind the scenes. Fortunately, there is one eyewitness account, that of the upstart Paul himself. This Paul wrote a letter to a church in place called Galatia – central Turkey of today. In this letter that 1,500 years later would spawn the Protestant revolution of Martin Luther, Paul makes it very clear that deciding who’s on top is not just the stuff of prayer meetings. Like most politics, it’s really a contact sport. Reconciliation. So what do we learn from this experience that is now nearly 2,000 years old? How do these differences get resolved. Lessons learned from the first century would suggest two approaches – negotiation and compromise. Now Jesus moves from indifference to an attempted brush-off, telling her, “I was sent only to the lost sheep of the house of Israel,” meaning not to a non-Jew like you. This time Jesus gets in her face saying “It is not fair to take the children’s food and throw it to the (little) dogs.” In today’s world this would be considered an insulting if not racist statement, especially given that the Greek term for “little dogs” can be taken as a more vulgar characterization. Game, set, match. At this, Jesus can see he has been outmatched. He has no choice but to relent, saying: “Woman, great is your faith! Let it be done for you as you wish.” And so, instantly her daughter was healed. So, what do we have here. Very simply – a remarkable negotiation. Conflict, dialogue, but no compromise here. The Canaanite woman gets what she has come for; Jesus gets a clear demonstration of what he wants – a clear win, win. In contrast, with the early Christian church, it’s less about negotiation and more about compromise. After Jesus the founder of the Christian movement has left the earthly scene, the issue at hand again centers on how a person outside the Jewish faith can be accepted – inside the camp. Only this time the specifics relate to the Jewish practice of circumcision – an issue we have seen surface again in our own time (thought for ostensibly different reasons today). This is the one and only time reported where the three leaders of the early Christian Church – Peter, James and Paul – find themselves in the same place at the same time at what is known today as the Council of Jerusalem. Peter is the man in the middle who had been blasted by Paul for his advocacy of circumcision for non-Jewish converts. This time Peter vouches for Paul, saying that cultural traditions should be set aside to bring more into the fold. Paul describes his work at evangelizing new converts to this new religion, then the church leader James then steps up to make the final pronouncement – giving Paul what he wants not carte blanche but with conditions that involve other less onerous elements of Jewish law (like no idolatry, no immoral sexual practices, no eating improperly slaughtered animals). This is not a win-win negotiation but a compromise where each side gives to get. And by Paul’s letter to the Galatians, it’s not clear that he felt any too good about the deal that was struck. And he may have even twisted the terms of the agreement to his advantage. But that’s a topic for another day. And there are other voices – less heard but no less important to our understanding of the never-ending interplay between peace and conflict. Our world – Christian or otherwise – is defined not only by those who have been accepted as among the orthodox. Sometimes, those who step well beyond the mainstream have just as great an impact. For a modern example, think Steve Jobs. Within the Christian pantheon, there are at least two enigmas – people who end up getting shoved off to the side for reasons that are not readily apparent. One is the disciple of Jesus known as Thomas. This is the guy known as “doubting Thomas,” who would not believe Jesus had been crucified and resurrected until he personally felt the nail holes in Jesus’ hands. A person named Thomas or a follower of Thomas also wrote a gospel account of Jesus’ teachings. Called the Gospel of Thomas, it was never accepted with what became the canon of orthodox Christian writings. In fact, the manuscript of this gospel disappeared for over 1,000 years – with initial fragments again showing up in the late 1800s and a more complete manuscript in 1945. Clearly for Jesus as author of this new Christian faith, the reconciliation comes through seeking. Each of us may come to a problem with widely varied perspectives, opinions and biases. But, if there is a process that can lead to consensus, it is by seeking the truth. As the renegade, Thomas carries this further. Seeking and finding are not the end of the story. As Thomas says, finding is not the end all – its can be disturbing. But for those who stay the course, they will in the end marvel and rule over all. Ultimate redemption. And let’s consider that other enigmatic and controversial figure of the New Testament story – one Mary of Magdala (or Mary Magdalene as she is more commonly known). In all four gospel accounts of the life and death of Jesus of Nazareth, Mary is the pivotal figure in the period that runs through Jesus resurrection. While the details of each account vary, it is Mary and other women who first report Jesus as missing or resurrected. The other male disciples have a hard time believing. But Mary becomes the messenger to give hope and renewed faith back to the rest of the group. Mary stood up. She greeted them all (as disciples) and addressed her brothers: “Do not weep and be distressed nor let your hearts be irresolute. For his grace will be with you and will shelter you. Rather, we should praise his greatness, for he has joined us together and made us true beings.” When Mary said these things, she turned their minds toward the Good, and they began to ask the words of the Savior. Settling on a direction often comes only through conflict – and with those at the extreme ends of the conflict driving the solution. From Thomas, we see the theory of reconciliation. Seek the truth, be prepared to be further disturbed, and then marvel at not only the insights but new direction that results. From the infamous Mary Magdalene, we learn about the practice of reconciliation. The need to overcome fear and disbelief, and the importance of leadership in turning all participants toward a common understanding of what’s good. Back to Reconciliation. So, we’ve come full circle – back to the question of how do we find peace amid conflict. For the capitalist, it may be for the non-human corporation to live to fight on again another day. For the politico as for the theologian, it may involve skills of negotiation and compromise. For the heretic – it is the ability to test and some times change the boundaries – to create a new paradigm – a fresh way of looking at the world. And as we’ve seen, some conflicts never die – they just morph into new and varied forms over time. Digging Deeper? For a more in-depth review of this Christian heritage from the perspective of othodoxy versus heterodoxy, check out our full web site at www.jesustheheresy.com. All nations have cause for pause as rogue Iran reaches ever closer toward the capability to produce and deliver a nuclear device. No nation has more reason for concern than Israel. This country has more to worry about because of Iran’s expressed hostility to the Jewish state and proximity to Iran. Of greatest significance, the compactness of Israeli geography means that the detonation of even a single device could not only inflict great casualties, but threaten the very existence of the nation. Israel has been here before. There are at least two prior events that threatened the very existence of the Jewish state. In one case, the Israelis of the time successfully fended off the aggressor. In the other, the result was total loss with the resulting disappearance of a Jewish homeland for nearly two millennia. The reasons for success in one case and failure in the other are instructive. In 701 BC, King Sennacherib of Assyria invaded Palestine and laid siege to the capitol city ofJerusalem. Recognizing the threat, King Hezekiah of Judah diverted the springs of the city’s water source by means of a massive underground tunnel (pictured above) to contain the vital water source within the city’s walls and away from the Assyrian enemy. Despite the taunts of the Assyrians outside the walls intended to intimidate those inside the city, the Israelis held firm. With the help of a prophet named Isaiah, the Jewish king prayed to God for deliverance. In this case, divine intervention results in the mysterious overnight death of the 185,000 strong Assyrian military force. Jerusalem and the kingdom of Judah were spared for another century. A different fate befell Jerusalem and the Jewish state in the first century AD. This time the city and nation were no longer in God’s favor. A new rabbi, Jesus of Nazareth, forecast the destruction of the holy temple and city about four decades before the actual event. Three decades later (in 62 AD), James the brother of Jesus, known as the “Bulwark of the People,” was killed as the result of an illegally convened meeting of the Jewish ruling body known as the Sanhedrin. The controversial Jewish historian Josephus records that this execution was protested to the new Roman procurator by some of the “more equitable of the citizens.” As a result, the offending high priest was removed from office. But the death of James would set in motion a series of events leading to Jewish insurrection and the subsequent Roman destruction of Jerusalem 8 years later in 70 AD. Unlike nearly 800 years earlier, when Jewish resistance held firm and united against the besieging enemy, dissension within the walls contributed to the eventual collapse of the city and resulting leveling of the temple and city by the angered Roman legions. The resistance in the city essentially split between three factions including rural Zealots and urban Sicarii terrorists. What are we to learn from this? If there is a God, it is that Israel’s survival has and will continue to rest on human preparedness combined with divine providence. When Israelis prepare and God is supportive, the nation survives. Conversely, when the people are in disarray and God looks away, the results are grim. Survival is by no means assured. As in times past, Israel’s continued existence depends on human will to survive together with divine favor.